This guide describes how to use the Onyx DNS tool to manage DNS entries for domains using the Onyx Nameservers. If you are looking for instructions on how to add a domain to a new or existing Onyx site please read our connect your domain to Onyx guide for full instructions - this will configure DNS automatically for you. Your domain will automatically be added to Onyx DNS when you connect your domain to Onyx. Then from the top menu click the DNS dropdown and select the domain you'd like to work with. 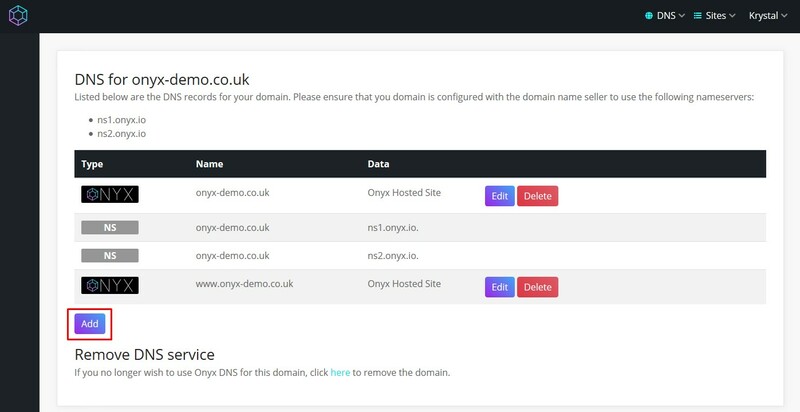 If the domain you'd like to add relates to a new or existing Onyx site, please follow our connect your domain to Onyx guide to add the domain as this will create all the required DNS entries. To add an unrelated domain and use the Onyx DNS tool to manage it's DNS entries click Add a DNS domain from the DNS dropdown. Enter the domain you'd like to manage with the Onyx DNS tool and click 'Add this domain'. You'll see a success banner, and now be able to Add/Edit/Delete DNS entries following the instructions below. To remove a domain from the Onyx DNS tool click the link under the 'Remove DNS service' title. To add a DNS entry, click the Add button. Select the type of DNS entry you'd like to add from the Type dropdown. Appropriate information will then be requested. Once entered click the Create button to add the DNS entry. To edit a DNS entry, click the Edit button. Once you've made the required changes click the Submit button within the Edit window. 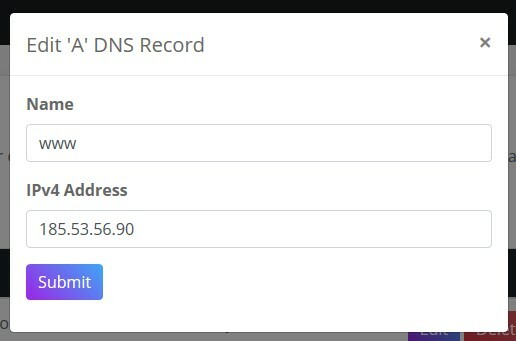 To delete a DNS record, click the Delete button. 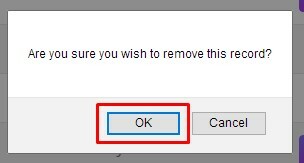 You will be prompted to confirm, clicking OK will delete the record.